The Garden is one of avant-garde director Derek Jarman’s final films, and intertwines an almost wordless story about two gay lovers who are arrested, severely humiliated, tortured and killed with religious imagery. Tilda Swinton (The Chronicles of Narnia: The Lion, the Witch, and the Wardrobe) stars with narration by Michael Gough (Batman Returns, Sleepy Hollow). 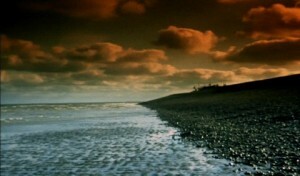 The film is set against the backdrop of Dungeness, which had been Jarman’s home since the late 1980s. Dungeness in the Shepway district of Kent is one of the largest shingle landscapes in the world. It boasts sound mirrors, two lighthouses and power station and is a popular film location having previously been seen on screen in The Poison Tree (2012), Parade’s End (2012) and The Inspector Lynley Mysteries – Natural Causes (2006). The Garden was released in 1990 and is now available to buy on DVD. This entry was posted in Filmed in Kent and tagged Dungeness, feature film, Pete Lee-Wilson, The Garden film locations, Tilda Swinton. Bookmark the permalink.